Getting feedback on how well we’re doing something and how to improve is one of the most powerful ways to learn and grow—as writers or anything else. Giving feedback also helps us grow because we get better at noticing how writers’ choices are affecting us as readers. As we distinguish between successful and less successful strategies, we improve our skills as reviewers. There’s also an additional benefit for our work as writers: As we see strategies used well by others, we expand our set of effective writing tools. This module explains Feedback and Improvement in the learning process. It also talks briefly about the qualities of helpful feedback and introduces detailed strategies you can use to get better at giving feedback. Feedback is information about how we are doing in our efforts to reach a goal. Research shows that students learn the most when they receive information about a task and how to do it better. Graduate student Rebecca Zantjer explains how being told to delete half of what she’d written freed her to improve her work. As Zantjer’s experience shows, feedback focuses on helping someone meet a goal. Helpful feedback gives us not only specific insight into how well we’re doing something but also advice on how we might do that thing better. A lot of “peer review” or “peer editing” does not produce feedback, however. 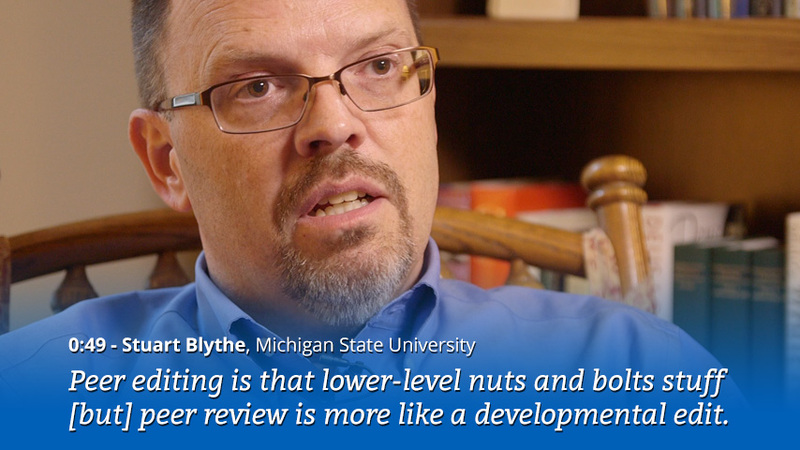 Peer comments often focus on copyediting, a term Michigan State University Associate Professor Stuart Blythe explains in this video. Copyedits are surface-level changes—spelling, grammar, syntax—that are best left until the last stage of the writing process, after revision is mostly complete. These sentence-level comments have the narrow goal of correction. Peer feedback, on the other hand, should have the broader goal of revision. According to Blythe, peers should be developmental editors, helping the writer strengthen their ideas. In other words, peer feedback that is focused on revision involves rethinking the purpose, goals, audiences, message/thesis, as well as organization and the form of a draft. Peer feedback should lead the writer to make big changes. Helpful feedback enables writers to “re-see” their ideas and words. If you want to help a writer who has understood the draft one way see it in a different way, then you first have to see it the writer’s way. You need to understand where writers are coming from and where they want the draft to go as they try to meet the goals of the assignment. Then, form your own interpretation of the writer’s draft—how well it meets the assignment’s criteria and how effectively the writer connects and expresses those ideas. We must have confidence in the feedback we receive from our reviewers. We have to trust that we are qualified to give helpful feedback. Trust is particularly important because feedback can lead to big changes in our writing. But trust has to be earned. Gaining confidence in the quality of the feedback we get and give occurs over time, with practice. If students can provide productive feedback, then collectively they will tend to get more feedback. And it will be more immediate feedback, because, rather than waiting for the teacher, their peers can provide it. More feedback improves learning, and immediate feedback is more effective than delayed feedback. 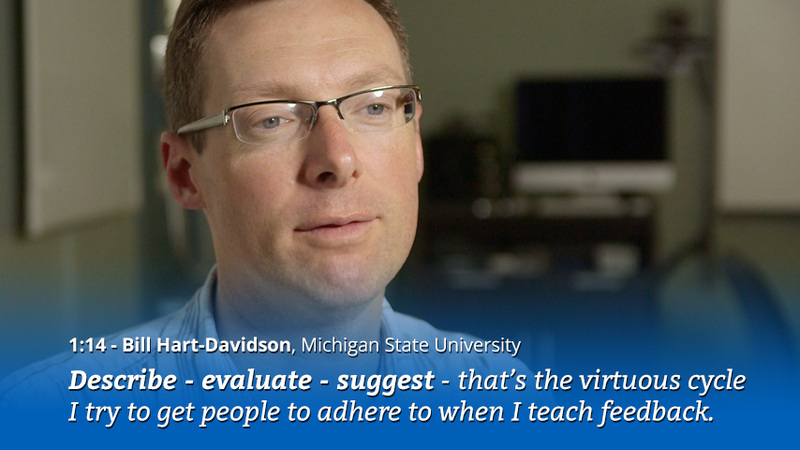 Even in small classes, instructor feedback is limited by the amount of time instructors have to respond. But more feedback and faster feedback is possible between peers. That feedback can sometimes be more helpful than instructor feedback. 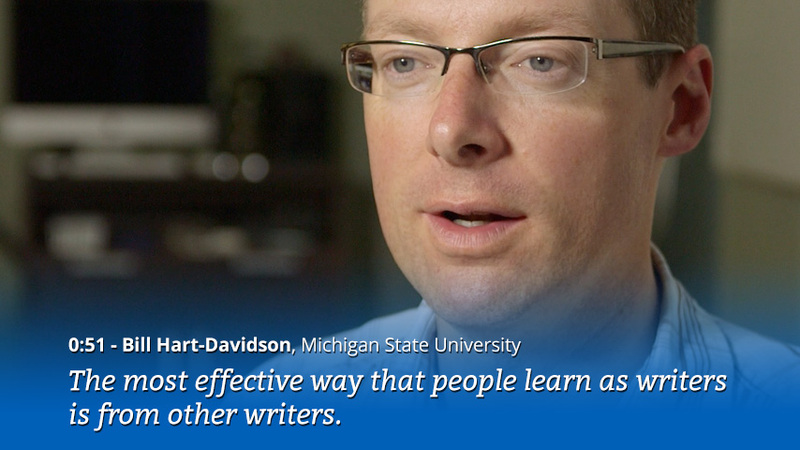 Michigan State University Associate Professor and Co-creator of Eli Review Bill Hart-Davidson explains why peer feedback can be so effective in this video. what seems missing or irrelevant. Good reviewers are good readers. Being a helpful reviewer means reading peers’ work thoughtfully and critically with the aim of helping them revise. And, if reviewers can do it for other writers, they can do it for their own drafts too. Giving helpful feedback teaches us to revise our own work. Learning to give helpful feedback is challenging, however. Few of us know how to do it well without preparation, but we can learn how to do it with coaching and practice. The next sections describe what helpful feedback looks like and offer strategies for how we can get better at it. What are the qualities of feedback you hope to get from your reviewers so that you can greatly improve your draft? When you know what you want to get from feedback, you have a better idea of the kind of feedback you should give. Helpful feedback is, first and foremost, constructive. Constructive feedback respects the work the writer needs to do to build a better draft. Reviewers and writers are on the same team. Together, your efforts will improve the draft. Focus on the writing, not on the writer — don’t suggest that problems in the draft are caused by failings in the writer. Talk about what can change in the draft to make it stronger, not what the writer needs to do better. Affirm what they were trying to accomplish and the work they did, especially if you are giving advice like the feedback Rebecca Zantjer received about deleting half of her draft. Tell writers when they need to make big changes. Don’t feel badly about giving good advice, and be sure the soften the blow too by explaining something you admire. Keep your focus on how the draft meets or fails to meet the criteria. Make the feedback personal by being kind. Be specific. Statements like “It was good” or “I liked it” are kind but unhelpful. These comments don’t give writers the insight they need to make improvements in this draft or in future drafts. Whether you are offering praise or criticism, be specific and mention how the writer’s draft met the goals. That’s a lot to remember! In this video, Bill Hart-Davidson offers a simple pattern for how to give helpful feedback, and he indicates that it might also be helpful in relationships too. Watch an extended clip of Bill Hart-Davidson discussing the describe - evaluate - suggest heuristic. It’s easy to overlook the descriptive step in favor of evaluation. Describing what you see is also a good way to build credibility as a reviewer. If writers can recognize what you see in their drafts, they’ll be more inclined to accept your evaluations and suggestions. Spending more time on describing will also help you give more thoughtful evaluations and may lead to more insightful suggestions. Seeing clearly can help you provide the feedback writers need to “re-see,” to revise. What they must do next by offering specific advice about what they can do to improve. These strategies won’t guarantee that our feedback is helpful. But, it’s a good frame to use as we practice. This module started with the claim that feedback is something we can get better at—both giving it to our classmates and using it ourselves to revise. In this section, we’ll look at specific things we can do to get better at both. The student is bright-eyed and full of ideas. The student is still writing the first draft. Feedback is given for the first time. Anxiety creeps in. The student revises - the deadline approaches. The student rushes to implement new feedback. Panic ensues. In such assignments, lots of time is invested in developing a fully-functional version of a text. Spending so much time on drafting has consequences for your work. You are more likely to ignore feedback because of impending deadlines. You are less willing to throw out substantial amounts of text, even when feedback suggests it could/should be done better. You’ll get feedback even at the earliest stage of the process. You’ll get feedback on smaller bits of writing, which makes it easier to revise. You’ll gain greater confidence that later drafts meet criteria. It’s easier to see where a writer is coming from and headed to if you are reading drafts as they evolve. It’s easier to give helpful feedback on smaller bits of writing. It’s easier to be confident in your understanding of the assignments’ criteria because of the survey-like nature of the reviews in Eli and because you’ll get so much practice applying the criteria and hearing them discussed. It’s easier to get better at giving feedback if you practice. You and your instructor will be able to gauge your performance as a reviewer through Eli’s helpfulness score. In the next module on revision, we’ll explain how writers’ evaluations of your feedback generate your helpfulness score. Think about your helpfulness score like a batting average, which changes every time a baseball player is at bat. Each time you give feedback, you have an opportunity to be extremely helpful, but being consistently helpful is far better for your average than a rare extraordinary comment plus a bunch of strikeouts. Use a framework like describe-evaluate-suggest to help you learn to be consistently helpful. Giving feedback also has additional benefits for your own writing. In the next module on revision planning, we’ll explore how your observations about other writers’ strategies can inform your own revision plans. The moves or connections you see in others’ work, you can apply in your own writing. We all learn by watching others, and review is a structured way of talking with writers about what you see in their work that they need to re-see as they revise. Getting and giving feedback is critical for learning and is one the strongest influences on achievement. Peers can give helpful feedback by being good readers of the assignment and of writers’ drafts. Helpful feedback is constructive and respectful; it describes, evaluates, and then suggests. Giving feedback regularly helps reviewers improve as reviewers and as writers. Interested in the research discussed in this module? See the instructor versions. Jun, Paul. “The Art of Feedback: Striking a Balance between Guidance and Criticism”. Life Hacker. Johnston, Peter. Opening Minds: Using Language to Change Lives . Maine: Stenhouse Publishers. 2012. These materials are licensed under a Creative Commons Attribution-NonCommercial 4.0 International License. This means you are free to copy and redistribute them in any medium or format and to remix, transform, and build upon the material, as long as you provide proper attribution to the authors (Eli Review, or Michael McLeod, Bill Hart-Davidson, and Jeff Grabill). Commercial use of this content is prohibited.